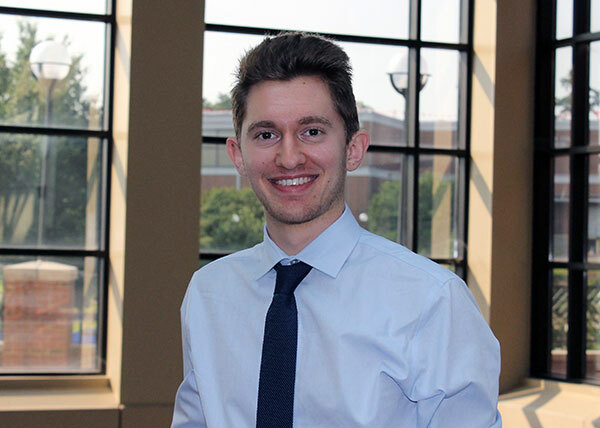 Michael Koohang recently completed an undergraduate internship at Georgia Tech that focused on civic data research. Thanks in large part to dual enrollment, Koohang will complete his B.S. in Information Technology by the time he is 18 years old. High School: "I received my high school diploma from Houston County High School. During my time at Houston County, I played three years of varsity soccer, competed nationally and served as an officer in Future Business Leaders of America (FBLA), and participated in numerous community service events through Student Council." Employment: "I am a full-time student, but I also work as a part-time IT tutor and lab assistant within the Middle Georgia State University School of Information Technology." Degree Objective: Bachelor of Science in Information Technology with a concentration in Software Engineering. Activities: "As a student at Middle Georgia State, I have participated in a number of organizations including President’s Torch Society, where I currently serve as officer of communications, Association of Information Technology Students (AITS), where I currently serve as president, and Alpha Iota Mu, an honor society within the School of Information Technology for which I serve as treasurer. In addition, I enjoy playing intramural soccer, and I am an avid participant in hackathons, frequently traveling to Atlanta to compete in challenging and exciting coding/programming competitions." Career Goals: "Ever since I discovered my passion for software engineering, my main goal has been to create software that has a positive impact on people’s lives. In order to do that, I’ve set my mind to work as a software engineer within the private sector, while also working on open source projects in my spare time. I find software engineering to be extremely logical, but also equally creative. It’s this perfect blend, coupled with the immediate impact that software can have on people, that makes me passionate about pursuing such a career." He chose Middle Georgia State University because … "It is extremely convenient, and the IT program is very strong. The convenience of Middle Georgia State lies within its close proximity, affordable cost, and the speed at which it allowed me to graduate. I live relatively close to the University, thereby making it easier for me to commute to campus and save money that I would otherwise spend on housing. Middle Georgia State also possesses a strong advantage in its affordability, while also maintaining a high standard for quality education. In addition, I started off as a dual-enrollment student during my junior year of high school. By finishing my education at Middle Georgia State, I will be able to graduate with my bachelor’s degree at the age of 18, which I would not have been able to do otherwise. "Furthermore, Middle Georgia State possesses a strong IT program that is both challenging and intellectually rewarding. The curriculum is highly experiential and project-based, allowing students such as myself to apply everything we learn in the classroom to real-world settings. The courses are also structured in a way that provides students with breadth in how they want to approach the content they are learning. I also had the wonderful opportunity to work with the IT faculty during my high school years, and I wanted to continue doing so after I finished high school." The greatest thing he discovered about Middle Georgia State was … "The culture of teaching and success that is present throughout the University. Every professor I had a course with was always extremely focused on seeing their students succeed. The time, effort, and commitment that faculty members put into ensuring that their students understand the course content and are also able to apply it to their own lives is wonderful to see from a student’s perspective. The culture also helps students discover what success means to them and how they can achieve it through the major they decide to pursue. This tremendously helps students to develop a sense of dedication and passion for their field of study and the careers they plan to pursue." His greatest academic experience as a Middle Georgia State student has been … "Participating in the Civic Data Science Research Experience for Undergraduates (REU) internship at Georgia Tech. I have always been interested in pursuing a graduate degree, but I wanted to experience what it was really like to conduct research at a large institution before I moved forward with the decision. During the program, I worked with professors in the School of Computer Science to develop an SMS chatbot, as well as a website, that allowed citizens of Atlanta to report rat sightings and evidence. We visualized the data collected using various maps in order to convey our findings to government entities within the city so that they would address the rat infestation issue. Thanks to the experience, I am now prepared to attend graduate school and even more excited to begin utilizing my software engineering skills in the real world!" To him, greatness means … "Having the ability to achieve the goals that you set for yourself in life. Everyone has their own personal form of greatness. In order to find it, I believe that one must set and achieve goals for themselves that are personally gratifying and challenging. When an individual can challenge themselves to the point where they break their own limits, they are able to grow not only as an individual, but also as a collective member of society. As a result of this, one can discover their greatness." In five years … "After I graduate from Middle Georgia State, I plan to pursue a master’s degree in computer science from Georgia Tech with a concentration in either software engineering or human computer interaction. After I attain my master’s, I plan to go into industry and work as a software engineer at a tech company in a major city. In my spare time, I would like to work on side projects that utilize data science and software engineering to contribute to the betterment of society. I also plan to volunteer for STEM related organizations, create businesses through websites and mobile apps, and do anything else that might seem interesting to me (i.e. picking up guitar, learning how to DJ, reading more books, etc.)."